Sun rise, sun set, sun time warp back to the 1960s. This week we bid adieu to Harley Quinn, while welcoming Juan and the baby Braddock. Oh, and the X-Men are time-traveling again. 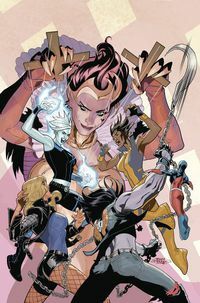 SuperQueeros: all that's lesbian, gay, bisexual, transgender, and queer in comics today! 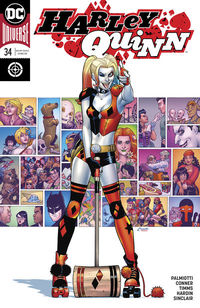 Harley's solo series is coming to a close in issue #34! With political plots and character deaths in the rearview mirror, where is the clown psychologist of crime directing her horse to ride? Into the sunset, or onto a new stage? This issue the team gets a new member: Juan. But is he just a powerless punching bag or will Waller's latest volunteer mark the beginning of a new era in Task Force X? When Batman assembled the JLA, he was aiming to take down one big threat: The Queen of Fables! This enemy is beyond the team's wildest imaginings - because that's where she's from! Can Ray, Vixen, and the rest of the team take down this powerful reality warper, or will the Queen warp the team to her purposes? Iceman, Marvel Girl, and the rest of the original X-Men are back where they started, but so are their earlier selves! Will the X-Men whoop the X-Men, or will the presence of Professor X calm everyone down? The conclusion of "The Heart of Riverdale" finds everything in a state of flux. Will the gang survive their first major story arc? The Excaliber team reunites in order to meet the new Braddock baby! The Silver Swan is out for revenge, and her former best friend is the only target in her sonic sights!